Adele is a pop music icon in her own right, but she recently dressed up and paid homage to one of her favourite stars — Dolly Parton. Earlier today, the British diva shared a photo on Instagram, showing off an uncanny costume of the blonde country superstar. She captioned the photo, calling Parton "the effortless queen of song" and "a hero of my life," before signing off with an "I'll always love you." It's not entirely clear why she was dressed up as the country queen, but plenty of people are sharing their love the look. Even Parton herself responded to festive get-up, commenting on Adele's photo: "And I will always love you!" 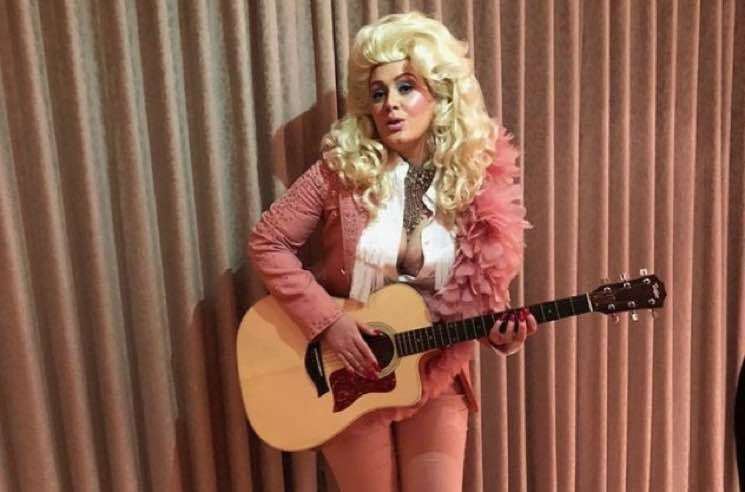 UPDATE (1/31, 9 a.m. EST): Parton has responded to the photo with a video message of her own, sharing her admiration for Adele's costume and thanking her "for making me look good." She also joked that having a fraction of Adele's fans would help her buy some new clothes and wigs. Watch the clip below. See some of the other reactions to Adele's Dolly-inspired costume below. HOW is Adele pulling off BLUE eyeshadow ??? Who can do that??? How??? ?